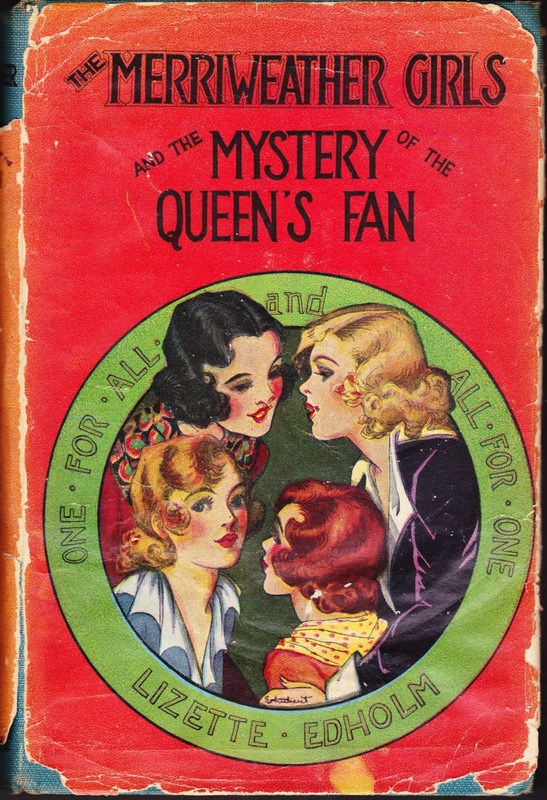 Papergreat: Dust jacket: "The Merriweather Girls and the Mystery of the Queen's Fan"
Dust jacket: "The Merriweather Girls and the Mystery of the Queen's Fan"
Dust jacket illustrator: Not sure. Looks like "Schubert" is scrawled at the bottom. First sentence: The broad Hudson shimmered gaily in the sunshine of late summer, tiny rippling splashes of white dotted its surface and some of the joy of the day was reflected in the faces of the three girls who sat on the hillside far above the river bank, each intent on her own thoughts. Last sentence: "Then yo-ho-ho for Campers' Trail!" they chanted in a gay chorus. Random sentence from the middle: But if Phil was nervous and depressed over what had happened up to this time, he had reason to be still more concerned when the detective accompanied him home and began to question him privately. Front-flap dust jacket blurb: "The Merriweather Girls, Bet, Shirley, Joy and Kit are four fun-loving chums, who think up something exciting to do every minute. The romantic old Merriweather Manor is where their most thrilling adventures occur. The author has given us four exceptional titles in this series — absorbing mysteries and their solutions, school life, horseback riding, tennis, and adventures during their school vacations. Every red-blooded, up-and-going girl is going to love these books." Goodreads review excerpt #1: Leslie wrote: "The first sentence of the book is transporting. ... I wish the rest of the book was as well." Goodreads review excerpt #2: Susan wrote: "While I enjoyed this series opener for its nostalgia, I can not necessarily recommend it to contemporary readers. It was a sweet journey, though." Other books in series: The Merriweather Girls on Campers' Trail, The Merriweather Girls in Quest of Treasure, and The Merriweather Girls at Good Old Rock Hill. Notes: The four titles in this series appear to be the only books that Lizette MacCully Edholm (1878-1967) ever published. ... Her husband, Charlton Lawrence Edholm (1879-1945), was also an author, as detailed on the Tellers of Weird Tales blog. ... The back of this dust jacket advertises some other Goldsmith titles, including Helen in the Editor's Chair; Jane, Stewardess of the Airlines; S.W.F. Club and Cheer Leader. I lost eight minutes of my life, because I was sure that I had previously blogged about Helen in the Editor's Chair. But apparently that must have happened in a parallel universe, because I cannot find any evidence it ever happened in this dimension. ... Speaking of juvenile-fiction series of the early 20th century, Wendy from Roadside Wonders and I were recently discussing a Mental Floss article titled "15 Children's Books No One Reads Now," and it was determined that I should embark upon writing a new juvenile-fiction series titled Betty Sue and the Crofthaven Campers. So that's now been added to the list of projects. Look for it soon.